George Romero's third zombie film, 1985's Day Of The Dead, may not be regarded in the same light as perennial favorites Night Of The Living Dead and Dawn Of The Dead but it's definitely got its fan base, and there are plenty of us around who consider it to be a better picture than the two that came before it. 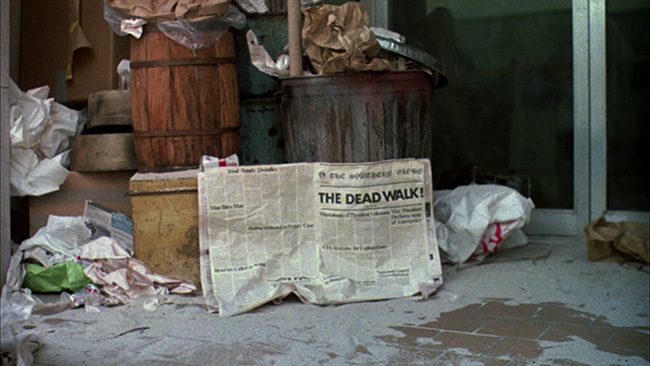 When the film begins, the living dead have more or less taken over. The cities are empty and what's left of mankind, at least in the small geographic area that the film focuses on, have gone underground. Literally. 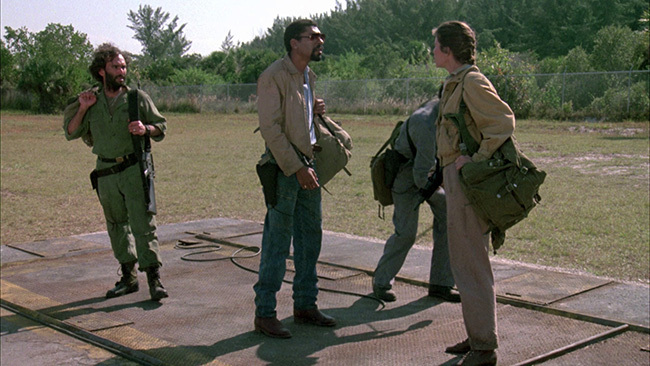 A group of survivors, made up of civilian scientist types such as Sarah (Lori Cardille), Logan (Richard Liberty) and John (Terry Alexander) and military types alike, live their lives as best they can while a scientist experiments on a captured zombie named Bub (Howard Sherman), who might actually be showing signs of intelligence. 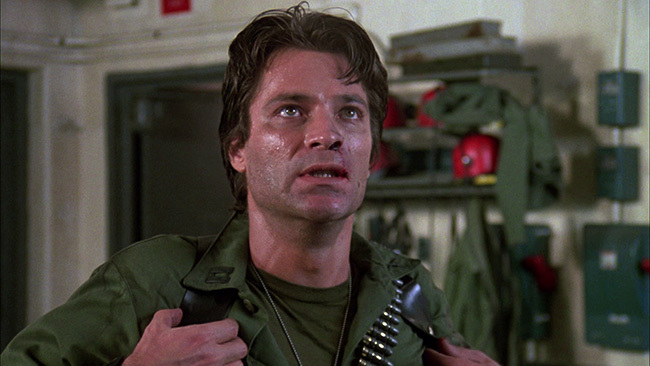 The scientists begin to lose faith in the military, led by Captain Rhodes (Joe Pilato), who in turn begins to wonder what they scientists are actually up to, and tensions rise while the hordes of zombies above ground begin to encroach around them. Touted as ‘The Darkest Day Of Horror The World Has Ever Known.' Romero's third go round in the world of the living dead is a grim and depressing film, which in many ways makes it more believable than the two that came before it. His knack for working social commentary and politics into his storytelling works very well here, as the commentary is considerably more subtle than it was in Dawn, and spends less time playing with themes of race relations than Night, instead focusing on the relationship between the military and scientific communities. 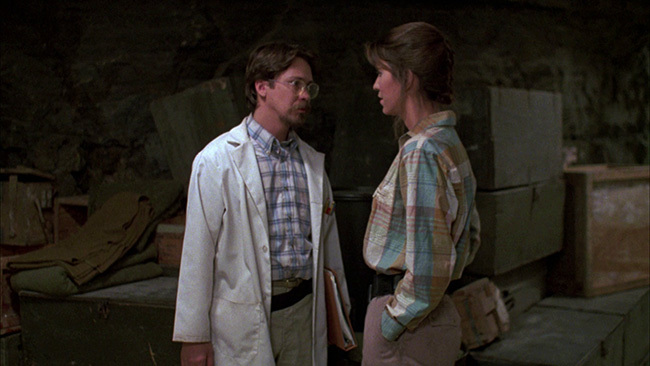 Romero once again gives us an interesting female character that is able to show strength and intelligence in a male dominated world. 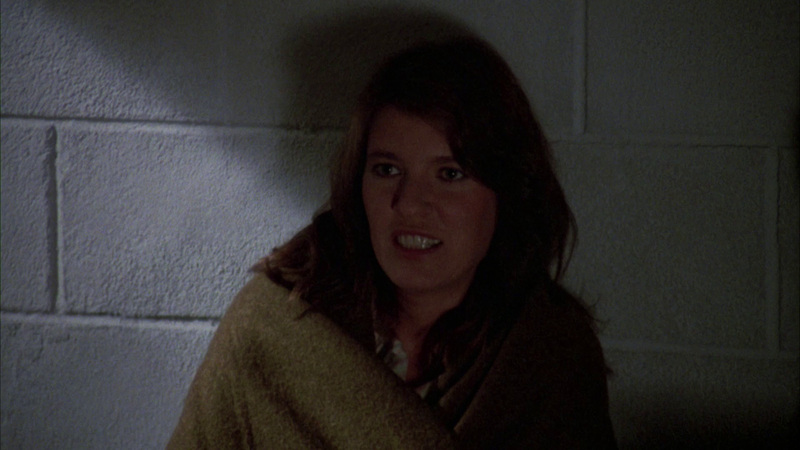 Lori Cardille makes for a sympathetic and likeable Sarah, doing her best to stay calm under dire circumstances while Pilato's Rhodes slowly starts to go more and more off his rocker. The bunker makes for a great setting for Romero's apocalyptic storyline to play out against, as the location (he shot the film in an unused mine) really helps build some tense and claustrophobic atmosphere. 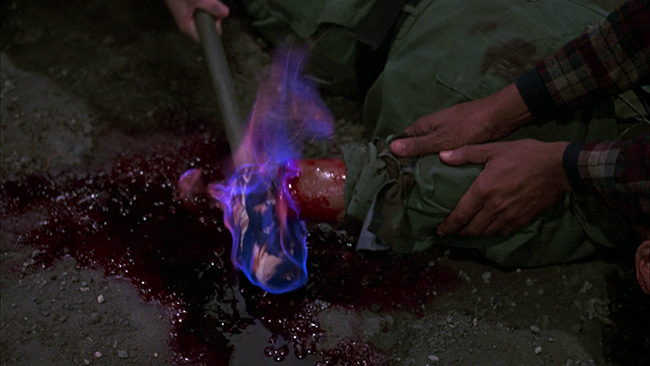 One top of that, the gore effects here are not only more plentiful than what he and his crew had created before but also considerably more realistic. 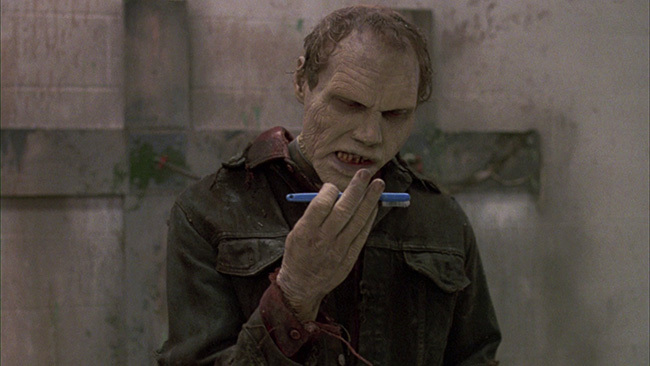 The zombie make up is also improved over Dawn Of The Dead's ‘blue faced' shuffling hordes, somehow managing to make the zombies seem like a more realistic threat in this film. The film isn't perfect - the subplot with Bub isn't exploited as fully as it could have been and while the interaction between he and Dr. Logan is interesting, it doesn't wind up adding all that much to the central plot. 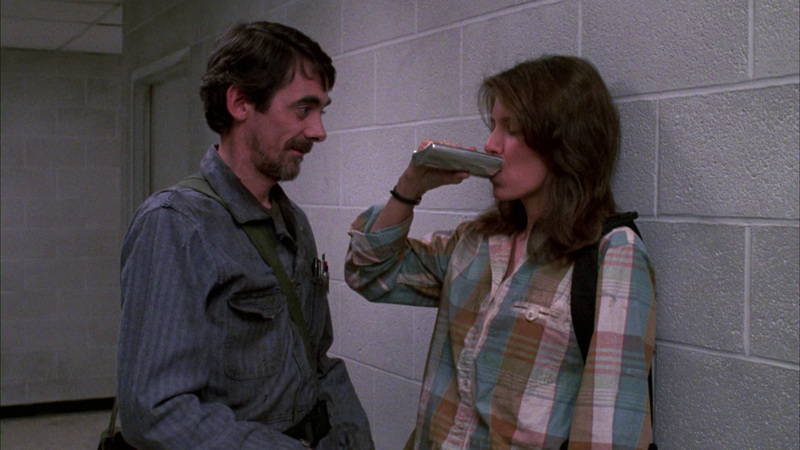 It almost seems like there should have been more done with these two characters, but generally the plot stays on target and while the cover can often seem the most important part of the picture (it really is considerably stronger than the two prior films), Day Of The Dead ends the first run of Romero's zombie films on an appropriately dark, bleak and dreary note. 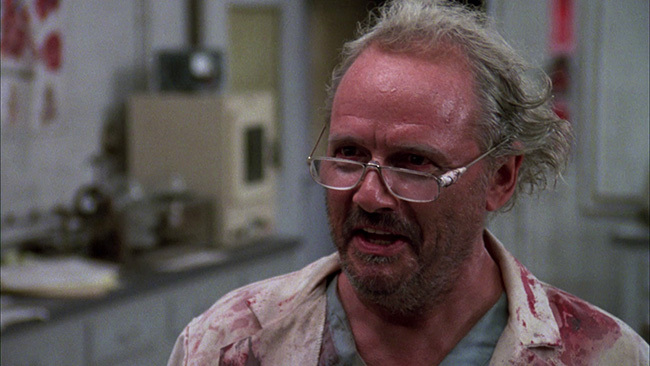 It's well acted, it's very well edited and Romero's background in industrial filmmaking seems to have somehow managed to let him get the most out of his sets and ideas here. 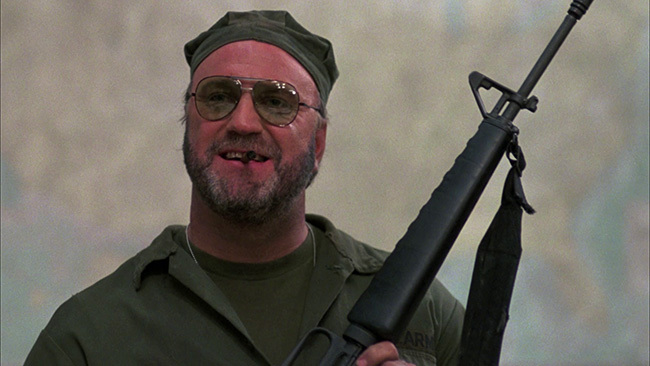 It's a film that is much easier to take seriously than Dawn Of The Dead and one which improves upon some of Night Of The Living Dead's rough edges to create a legitimate horror film, one which sticks with you and manages to make you think while at the same time getting under your skin. 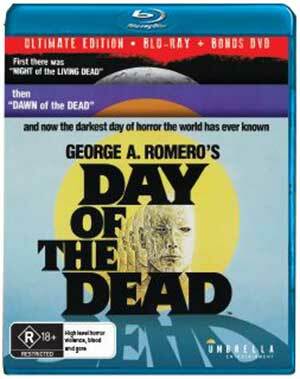 Umbrella Entertainment presents Day Of The Dead in an AVC encoded 1080p high definition transfer framed at 1.78.1 widescreen on a Region B locked 50GB disc with the feature taking up just under 31GBs of space. 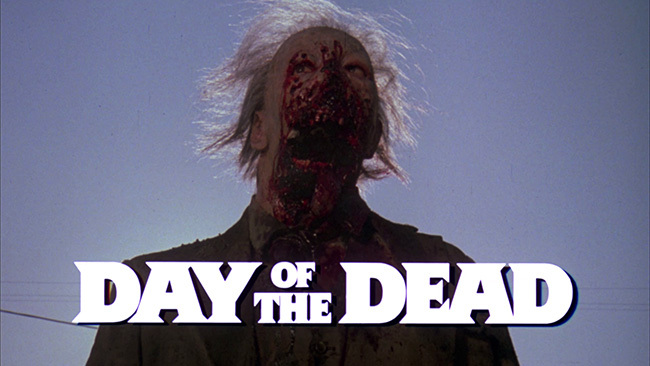 Umbrella Entertainment brings Day Of The Dead to Blu-ray on a 50GB disc in AVC encoded 1080p high definition framed at 1.78.1 widescreen using what looks like the master that Shout! Factory used for their 2013 collector's edition release. The colors look very, very close, if maybe a slight bit brighter, but detail and depth look to be the same. Some took issue with the color timing of that release, so if you weren't a fan of the way that image looked you're probably not going to like this one either - but personally I thought it looked quite good. 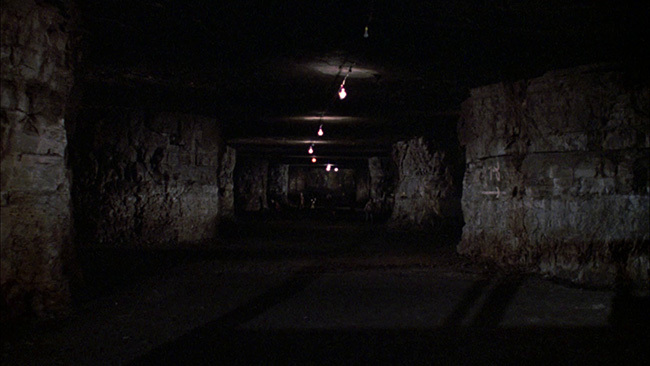 This isn't the most colorful film ever made, given that it takes place primarily in an underground bunker, but the grim backdrop does result in some nice 'pop' for the reds in the gore scenes. Detail and texture are pretty strong here but the transfer does show some obvious compression artifacts throughout. There are no noticeable issues with edge enhancement or noise reduction, however, and while the image shows almost no noticaeble print damage it does retain a natural amount of film grain. Audio options are provided in English language DTS-HD 5.1 and 2.0 options with removable subtitles offered up in English only. Other releases of this film have had problematic 5.1 tracks where certain bits of dialogue could not be head. Not the case here – the audio seems to be unaltered. 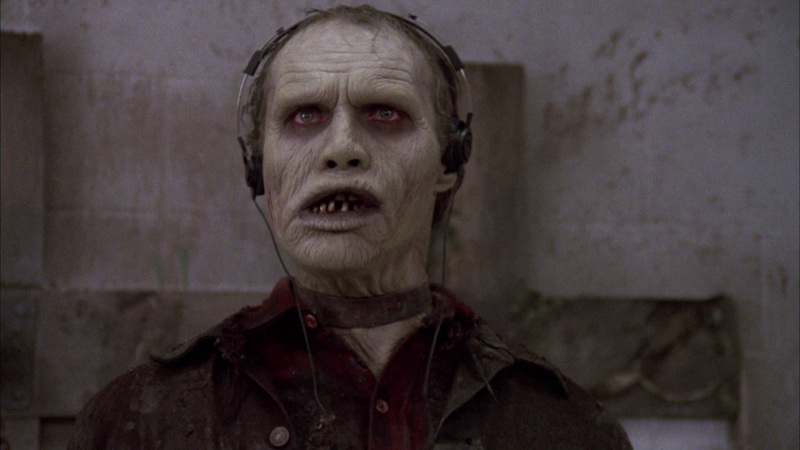 The extras on the disc are plentiful, beginning with an audio commentary track courtesy of Writer/Director George A. Romero, Special Make-Up Effects Artist Tom Savini, Production Designer Cletus Anderson and Actress Lori Cardille. This is a pretty comprehensive talk that covers the making of the movie from both in front of and behind the camera. It covers shooting locations, problems that arose during production, effects work, scripting the movie and pretty much everything else you could think of. The disc also contains a second audio commentary from Greg Nicotero, Howard Berger, Everett Burrell and Mike Deak. It’s a decent discussion that talks primarily about their personal experiences on the film, so it tends to focus on a lot of the effects work and the difficulties involved in that side of the production. Complimenting that nicely is an excellent ninety-minute-long feature length documentary entitled World’s End: The Legacy Of Day Of The Dead. 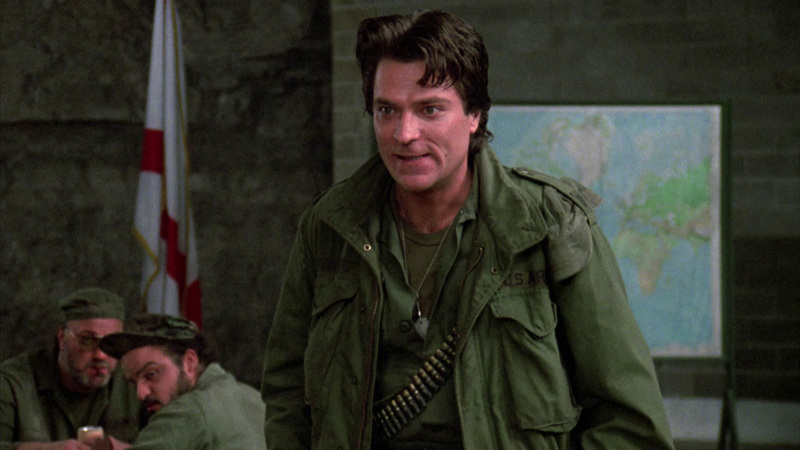 This is comprised primarily of interviews with pretty much everyone involved in the movie who is still around – from George Romero to cast members Lori Cardille, Joseph Pilato, John Amplas, Gary Klar, Terry Alexander, Anthony DiLeo, Howard Sherman, Debra Gordon, Mark Tierno and Phillip Kellam to crew members like Tom Savini, Pasquale Buba, Michael Gornick, John Harrison, Bruce Alan Miller, Dean Gates, John Vulich and Everett Burrell. With so many people involved in the making of the movie interviewed here, we wind up with what is basically the definitive ‘making of’ piece for Day Of The Dead. Sure, it does cover some of the same ground as the commentary track, by default it sort of has to, but it really is a well put together and ridiculously thorough piece. The cast discuss their characters, working with Romero, and their thoughts on the movie, Romero himself talks up the specifics of making the picture and where he was going with this project. 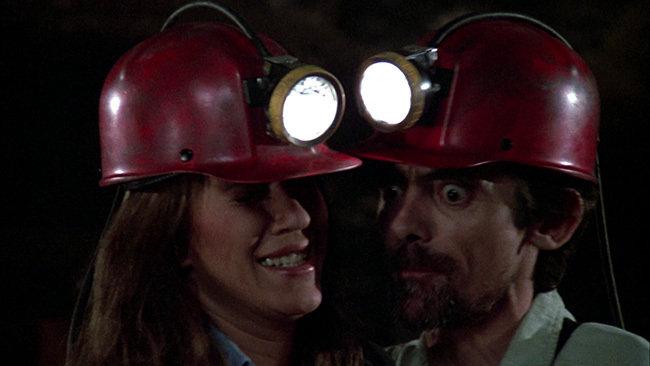 Savini, of course, covers the effects as do a few of the other technical types involved and there’s some great discussion of what it was like shooting in the mine location and some of the difficulties that entailed. 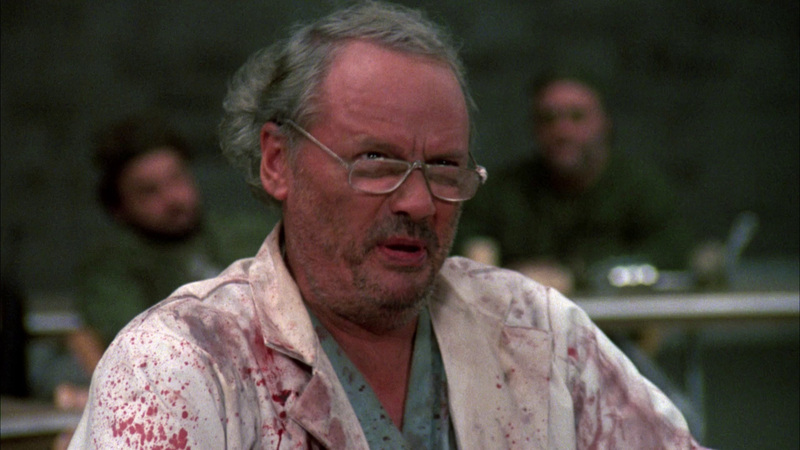 This really is a ‘warts and all’ discussion of the movie, an honest talk about what went into putting together one of the finest movies to tackle the subject of zombies that covers both the good and the bad. This featurette alone will be reason enough for most fans to want to own this release. After that? 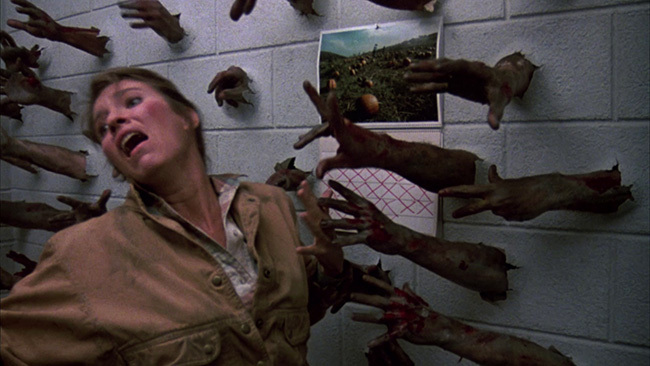 We dig into Behind The Scenes With Day Of The Dead, a vintage twenty-one-minute piece that shows off some pre-production work as well as behind the scenes footage from the set of the shoot for the feature. There's some neat footage of various people working in the office as well as cast and crew hanging out on set, talking to the camera about what they're working on, showing off various props and special effects bits. 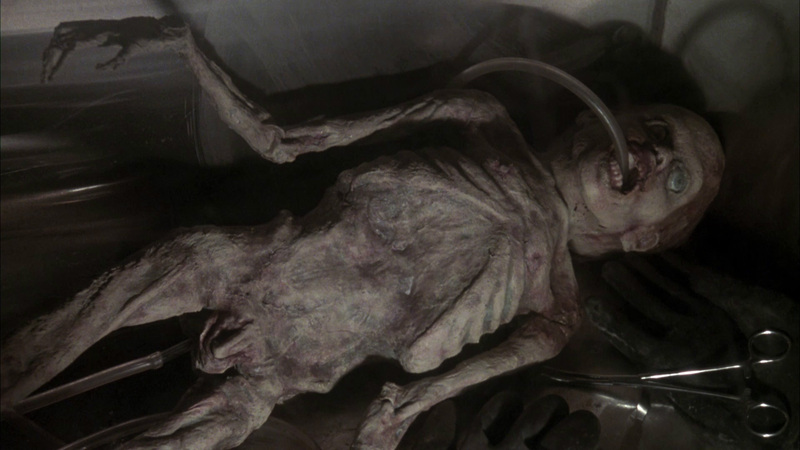 We learn about the importance of refrigerating meat, enjoy some unusual fashion choices, see zombie extras hanging out on set eating apples and watching TV, and plenty more. 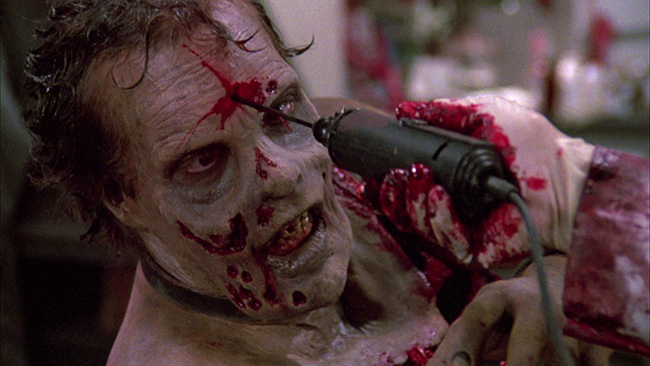 We also get a chance to see Savini at work and yeah... lots of great effects team footage here. We also get the chance to see Romero directing his cast and crew here as well – neat stuff. Up next is Day Of The Dead: Behind The Scenes, a thirty-one-minute piece that features footage From Special Make-Up Effects Artist Tom Savini’s time spent on set. 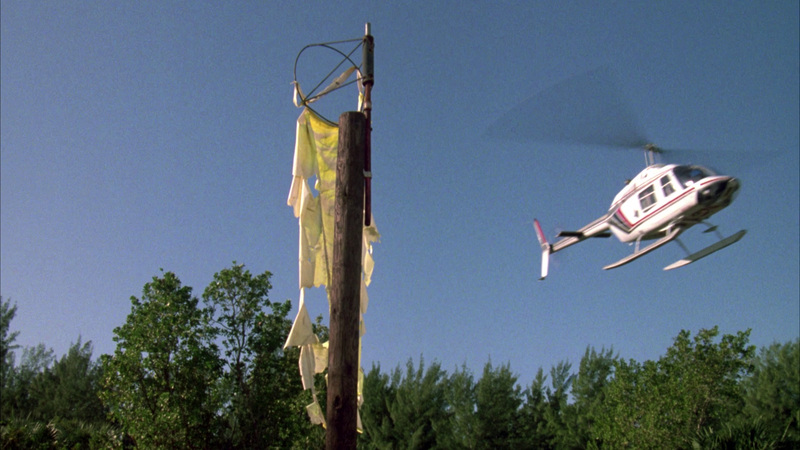 This is just what it sounds like – footage that Savini shot on set during the production. There’s a fair bit of emphasis here on the effects work, which makes sense given Savini’s involvement, but it’s cool to see. From there, jump into the forty-nine-minute Melbourne International Film Festival’s ‘In Conversation With George A. Romero’ piece wherein Guilia D’Agnolo Vallan interviews the man himself about his entire career – they talk about his later zombie films and how they relate to the ‘Dead Cycle,’ the personality of his pictures, how important it was to him to have people documenting what was happening, the reality in which his zombie films play out, the advent of the internet and social media, his love of horror comics and their influence on Creepshow and his early cinematic influences. They also discuss how he gets involved, the practicality of getting films distributed, what makes Knightriders stand out from the rest of his work, some of the effects guys that he’s worked with over the years, his feelings on the Hollywood system, the zombie resurgence and quite a bit more. Rounding out the extras on the first disc are three different trailers for the movie, four TV spots and the eight minute vintage Wampum Mine Promotional Video originally created as a business development tool for the mine used as the movie’s primary location. Umbrella has also included a second disc in this set, a DVD, that contains a few more extra features starting with The Many Days Of The Dead which features interviews with Romero, Savini, Nicotero, Howard Sherman, Joe Pilato, Lori Cardille and a few others. It’s an interesting look at the making of the film and its impact. 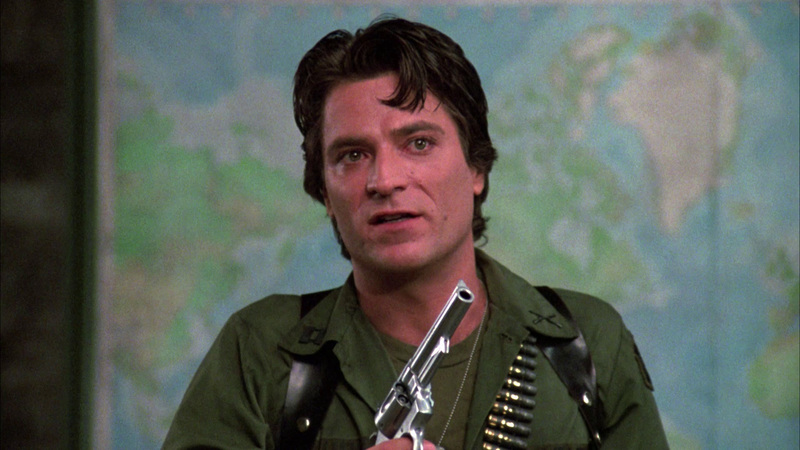 From there, dig into Joe Of The Dead, which is basically a career overview of Joe Pilato’s career as told by Joe himself. Anyone who has seen Pilato at any of his convention appearances knows that he can get a bit rowdy and is rarely at a loss for words, so he’s got a lot to say about his work on this film and a few other earlier pictures that he was involved in. 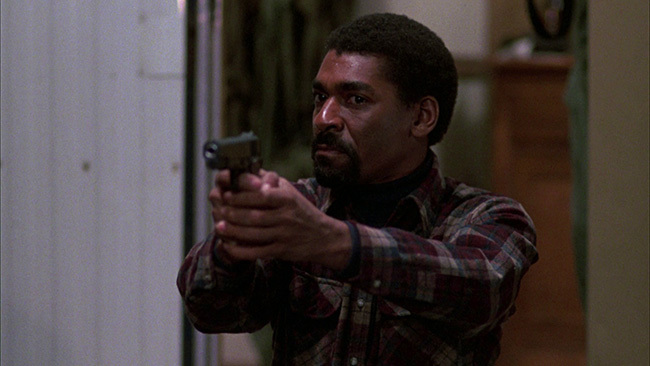 For more Pilato goodness, check out the second exclusive featurette included on the first disc, titled Travelogue Of The Dead, which follows Joe (and Ken Foree!) around as he makes various appearances in the UK to promote the movie. Interspersed here are comments from fans of the film, some of whom elaborate quite well about their appreciation of the film, while some of the others don’t fare quite as well. 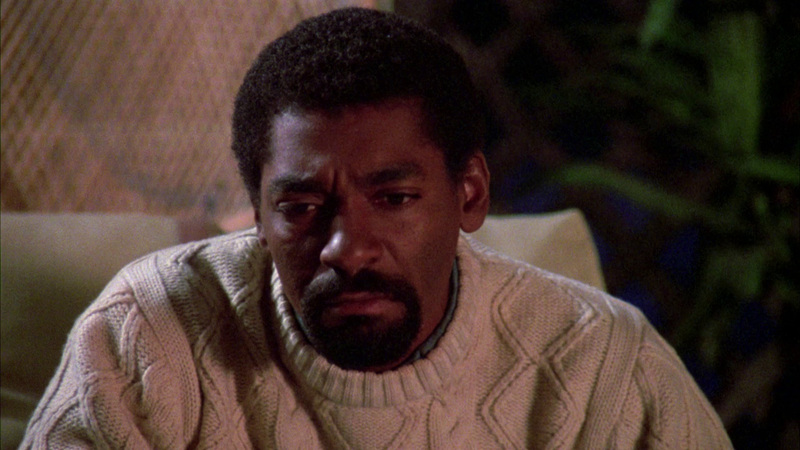 Reflections On The Living Dead is a seventy-eight-minute piece that documents an event where ‘for the first time in years’ the four ‘giants’ of Night Of The Living Dead had a roundtable discussion about the making of the classic horror film. 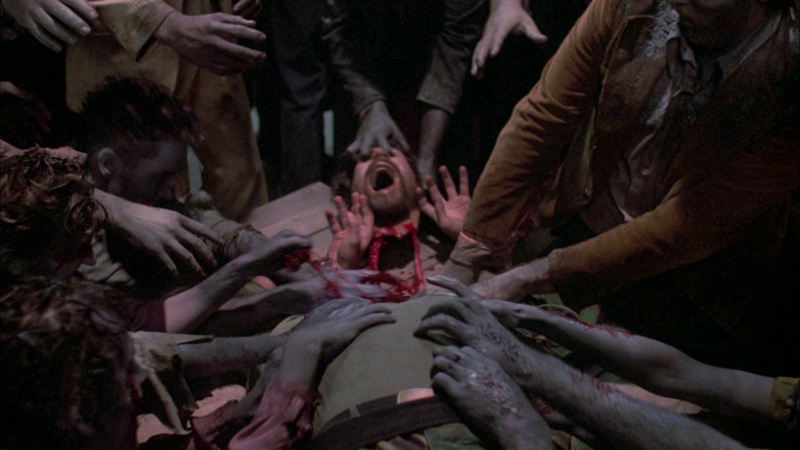 Here Romero, John A Russo, Russell W. Streiner and Karl Hardman get together to talk about how the film came about. There’s also footage here where filmmakers influenced by the movie – Tobe Hooper, Fred Olan Ray, John Landis, Sam Raimi, David DeCouteau, Scott Spiegel, and Wes Craven along with writers like Chris Gore and David E. Williams show up to talk about the importance and influence of the film. Rounding out the extras on this second disc is a generous still gallery of behind the scenes and promotional images. This release also features reversible cover art with the new illustrated cover on one side and the theatrical poster on the opposite side. 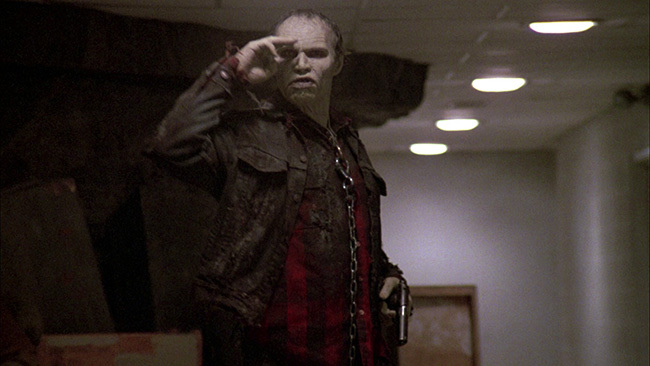 Day Of The Dead is bleak, it’s uncompromising and it’s almost relentlessly grim – these qualities make it the most intense of Romero’s original ‘Dead Trilogy’ and it stands as one of the best zombie movies ever made. 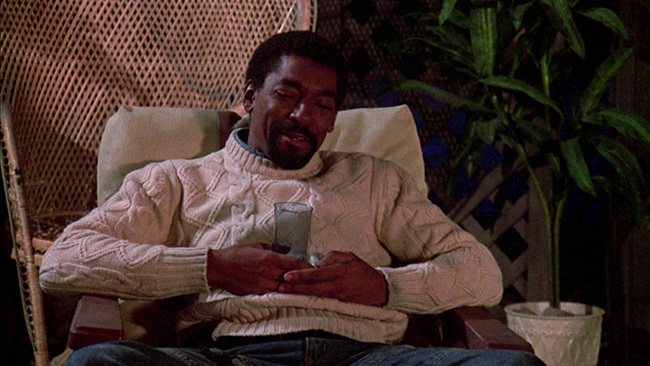 Umbrella’s Blu-ray release carries over a lot of the ‘better’ extras from past editions (though not all of them) but presents the film with a dated transfer. Click on the images below for full sized Day Of The Dead Blu-ray screen caps!